If you were any closer you would have to enroll. 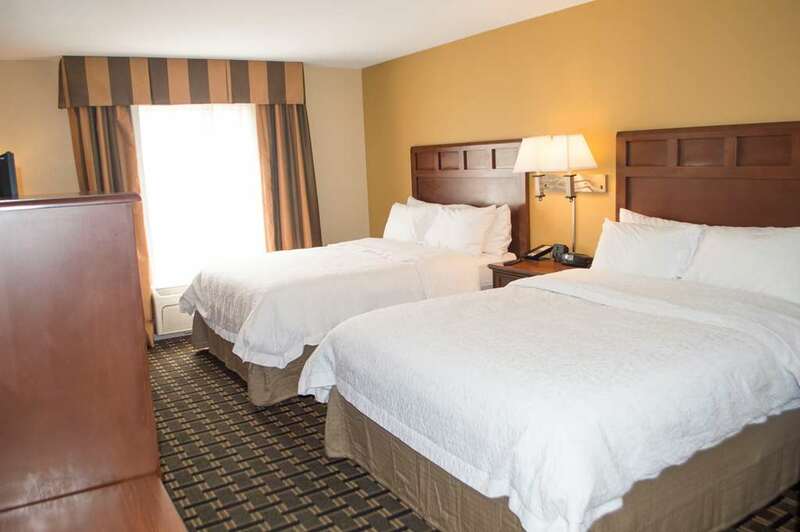 The Hampton Inn and Suites Columbia - University of Missouri is the closest hotel to the University of Missouri and minutes from Downtown Columbia Missouri. So close that the University of Missouri is just across the street from our hotel. Want to see a game. Farout Field - Hearnes Center Fieldhouse and the Mizzou Arena are all within walking distance of our Hampton Inn and Suites hotel. Got the sniffles. World-class healthcare is a block away including the University of Missouri Hospital Center - Childrens Hospital and Truman V.A. Hospital. How about shopping. The District downtown shopping offers an eclectic shopping and dining experience with tons of entertainment choices. Since it is only one mile away from the Hampton Inn and Suites Columbia - University of Missouri hotel you can shop till you drop. The arts more your speed. The Museum of Art and Archaeology - The Museum of Anthropology - Jesse Hall Auditorium - The Blue Note - Deja Vu Comedy Club - Missouri Art Gallery - The Youseum - The Bingham Gallery and much more are all within one mile away. On business. All the major Columbia companies are only a few minutes away from our Hampton Inn and Suites hotel - including Discovery Ridge Research Park. Rather stay in. The Hampton Inn and Suites Columbia - University of Missouri hotel has complimentary High Speed Internet Access - business center - business library - complimentary On the House hot breakfast - indoor swimming pool and our world class 100 Hampton service. We have five thousand square feet of meeting space - a boardroom and 3 hospitality suites for your small meeting or pre-tailgate get together. Any way you look at it the Hampton Inn and Suites Columbia at the University of Missouri hotel is the place to stay while you are in Columbia Missouri. Enjoy all Columbia has to offer while staying in the heart of it. We love having you. Addison*s American Grill: Addison*s American Grill offers pasta and pizza with casual relaxed dining experience. Bambino*s Italian Cafe: Bambino*s Italian Cafe offers Italian cuisine with a relaxed dining experience. Boone Tavern: Boone Tavern offers steak and seafood. Flat Branch Pub - Brewing: Flat Branch Pub - Brewing is a microbrewery with a diverse menu. Jimmy John*s Sub Shop: Jimmy John*s Sub Shop offers sandwiches and subs. Kaldi*s Coffeehouse: Kaldi*s Coffeehouse offers various coffee selections. Shakespeare*s Pizza: Shakespeare*s Pizza is a classic college town pizza restaurant that offers pizza and salads. Harpo*s: Harpo*s is a Columbia Missouri hotspot. McNally*s Irish Pub: McNally*s Irish Pub is a Irish pub and Deli.